I've been really inspired by the Spring air and it's given me a craving to paint fresh roses. 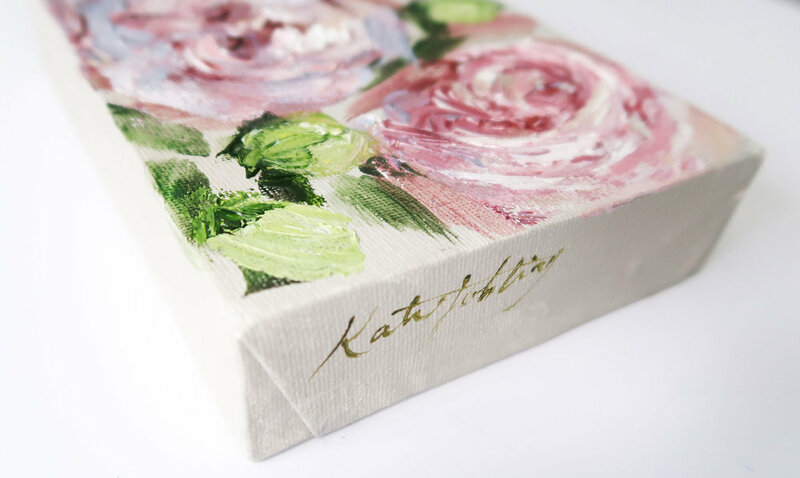 This is the story behind my newest release, mini floral canvases full of energy and beauty. All these paintings are 5x7" and have been painted on deep edge canvas, which means they stand up on their own. They make the cutest desk dwellers or shelf perchers. If you have a little shelf or corner that needs brightening, you might just find the perfect tenant in this collection. I've loved playing with these colours and shapes and feel like it's given me confidence to create something similar a bit larger - so watch this space. These paintings were created with fine quality oil paint and a palette knife. I have been loving my palette knife recently and found a great balance between abstract but recognisable. This is always my battle as an impressionist. Capturing the beauty and movement of an object, but adding a twist of something different with paint application. I hope you love this collection and you can purchase them here.